This course serves as an introduction to the diversity of wildflowers and ornamental grasses suitable for use in developed landscapes in Central and North Florida. Florida has the third greatest diversity of native plants of any state in the U.S., including dozens of flowering perennials, annuals and ornamental bunchgrasses. Many of these are now becoming available in the horticulture market and provide excellent “Florida-friendly” options to the expansive use of turfgrass in the landscape. This course will provide landscape architects with information needed to select and utilize the plants successfully in urban landscapes. 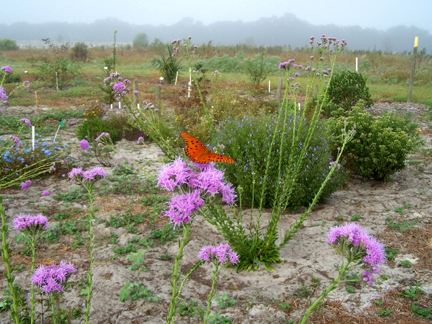 The course focuses on the best wildflowers and grasses adaptable to typical landscapes in Central and North Florida, including coastal and urban areas. Aesthetic, selection and maintenance characteristics will be covered for 15 species, and will include plants which are available but tend to be less well known and those which have shown tolerance for freeze events. Participants will become familiar with the unique attributes and landscape requirements of the plants, and gain a comfort level needed to incorporate the plants successfully into client landscapes. This course is appropriate for landscape architects, landscape design professionals and professionals involved in landscape installation and maintenance. It addresses the need to increase both the number and variety of native species in the landscape. A Guide to Florida Grasses, by Walter Kingsley Taylor, University Press of Florida, 2009. Atlantic Coastal Plain Wildflowers: A Guide to Common Wildflowers of the Coastal Regions of Virginia, North Carolina, South Carolina, Georgia and Northeastern Florida (Wildflower Series). Gil Nelson, Falcon Press Publishing, 2006. Best Native Plants for Southern Gardens: a Handbook for Gardeners, Homeowners and Professionals, by Gil Nelson, University Press of Florida, 2010. Florida’s Best Native Landscape Plants: 200 Readily Available Species for Homeowners and Professionals. Gil Nelson, University Press of Florida, 2003. Guide to the Vascular Plants of Florida, Third Edition. Wunderlin & Hansen, University Press of Florida, 2011. Florida Wildflowers, a Comprehensive Guide, by Walter Kingsley Taylor, published by University Press of Florida, 2013. Xeric Landscaping with Florida Native Plants. Michael Jameson and Richard Moyroud, editor, Florida Association of Native Nurseries, 2011 edition.